The designs are incredibly detailed, and at 38.1 mm in diameter, the coin perfectly reveals every nuance of the intricate details. 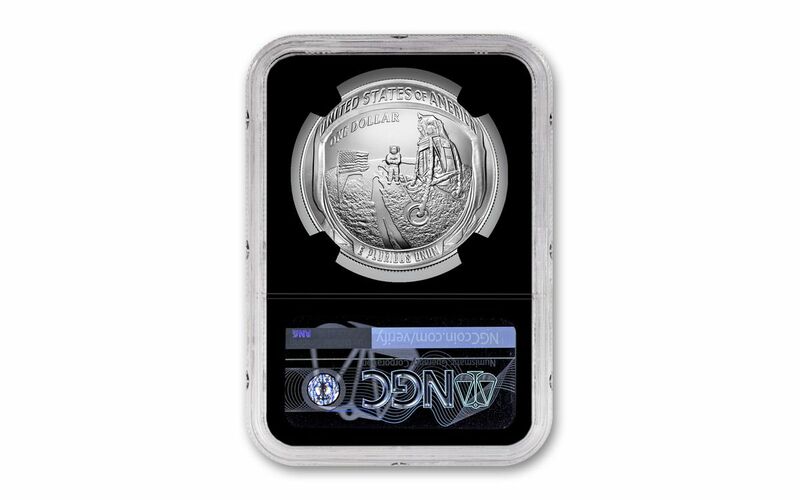 Struck in 26.73 grams of highly-pure 99.9% silver, your silver dollar has been graded by the Numismatic Guaranty Corporation (NGC) as being in flawless Mint State-70 (MS70) condition, a distinction that means your perfectly-graded coin will have ZERO imperfections – showing all features and fields exactly as the engraver and mint intended. 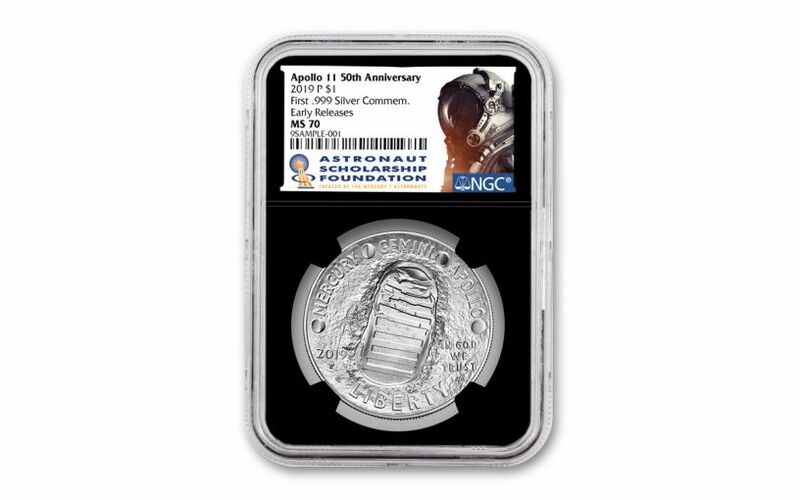 In addition, NGC has certified your 2019-P Apollo 11 50th Anniversary Silver Dollar to be an Early Releases (ER) coin, a designation that means your coin was received by NGC or an NGC-approved depository within the first 30 days of its release. Each coin will come sonically sealed in an acrylic holder with a black display core and an exclusive Astronaut Scholarship Foundation (ASF) label. With just 400,000 of these historic 2019-P Apollo 11 50th Anniversary Silver Dollars available, a quick sell-out is expected. In fact, the last time the U.S. Mint released a curved silver dollar was the 2014 Baseball Hall of Fame Commemorative Silver Dollar. That coin had a mintage of 400,000 and sold out in just 13 days! As a one-year-only issue, these curved coins will never be struck by the U.S. Mint again. When they’re gone, they’re gone! Don’t miss this historic release – it’s one small purchase for you and one giant leap for your collection! STRUCK IN HIGHLY-PURE SILVER – These commemorative coins have been struck at the U.S. Mint in Philadelphia in 26.73 grams ounces of highly pure 99.9% silver. GRADED IN PERFECT UNCIRCULATED CONDITION – Your 2019-P Apollo 11 50th Anniversary Silver Dollar has been graded by the Numismatic Guaranty Corporation (NGC) as being in flawless Mint State-70 (MS70) condition. KEY EARLY RELEASES CERTIFICATION – NGC has certified your 2019-P Apollo 11 50th Anniversary Silver Dollar to be an Early Releases (ER) coin. It will come sonically sealed in an acrylic holder with a black display core and an exclusive Astronaut Scholarship Foundation label. Put the first man on the moon into your collection and honor mankind’s crowning achievement with the 2019-P $1 Apollo 11 50th Anniversary Silver Dollar. Order yours now!